These gorgeous vintage Zuni Indian silver inlaid turquoise, coral, onyx, and mother of pearl finely detailed rainbow man screw back earrings measure approximately 1-1/4" by 11/16" each. Weight is 8.2 grams/pair. Like most older Native American jewelry, these are not stamped or hallmarked for silver content. They are sterling or a slightly lower grade of silver. Photos are not actual size. 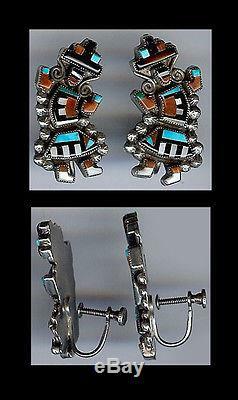 The item "VINTAGE ZUNI INDIAN SILVER INLAID TURQUOISE CORAL RAINBOW MAN EARRINGS" is in sale since Saturday, March 01, 2014. This item is in the category "Jewelry & Watches\Ethnic, Regional & Tribal\Native American\Earrings". The seller is "deja--voodoo" and is located in Santa Cruz, California. This item can be shipped worldwide.